Στην περιοχή Περιοχή Μπα Ντιν, το Palmo Serviced Apartment 2 αποτελεί ιδανικό σημείο για να εξερευνήσετε την πόλη Hanoi και τα περίχωρα. Το κέντρο της πόλης είναι μόνο μακριά και μπορείτε να φτάσετε στο αεροδρόμιο μέσα σε 30 λεπτά. Από τη βολική της τοποθεσία, η ιδιοκτησία προσφέρει εύκολη πρόσβαση σε κορυφαίους προορισμούς της πόλης. Με τις υψηλού επιπέδου υπηρεσίες και την μεγάλη ποικιλία ανέσεων, το Palmo Serviced Apartment 2 δεσμεύεται ότι η διαμονή σας θα είναι όσο πιο άνετη γίνεται. Τα 24ωρη υπηρεσία δωματίου, 24ωρη φύλαξη, ημερήσιος καθαρισμός, δωρεάν WiFi σε όλα τα δωμάτια, αυτόματο πλυντήριο είναι μόνο λίγες από τις εγκαταστάσεις που κάνουν το Palmo Serviced Apartment 2 να ξεχωρίζει από τα άλλα ξενοδοχεία στην πόλη. Απολαύστε ανέσεις υψηλών προδιαγραφών κατά τη διαμονή σας. Ορισμένα δωμάτια περιλαμβάνουν επίπεδη τηλεόραση, μοκέτα, προϊόντα καθαρισμού, κρεμάστρα ρούχων, γκαρνταρόμπα - ό,τι πρέπει για να αναζωογονηθείτε μετά από μια γεμάτη μέρα. Οι γυμναστήριο, γήπεδο γκολφ (σε απόσταση 3χλμ. ), κήπος του ξενοδοχείου είναι τα ιδανικά μέρη για να χαλαρώσετε και να ηρεμήσετε μετά από μια πολυάσχολη μέρα. Όταν ψάχνετε για ένα άνετο και βολικό μέρος για να μείνετε στη Hanoi,το Palmo Serviced Apartment 2 γίνεται το σπίτι σας μακριά από το σπίτι σας. Good Location, friendly staff and espiecally Ms Quynh who could communicate in English and offered her best form of service whenever she could. I would definitely recommend this hotel to my family n friends. Ps: the free laundry service was like icing on cake. I left worst review about this accommodation a week ago. I extreamly disappointed at that time but I tried book again in here. Finally I realized that all of staffs were so kind and perfect cleaned as I expected. I strongly recommend this accommodation again. and I am really sorry to host because I left worst review. Thanks again. 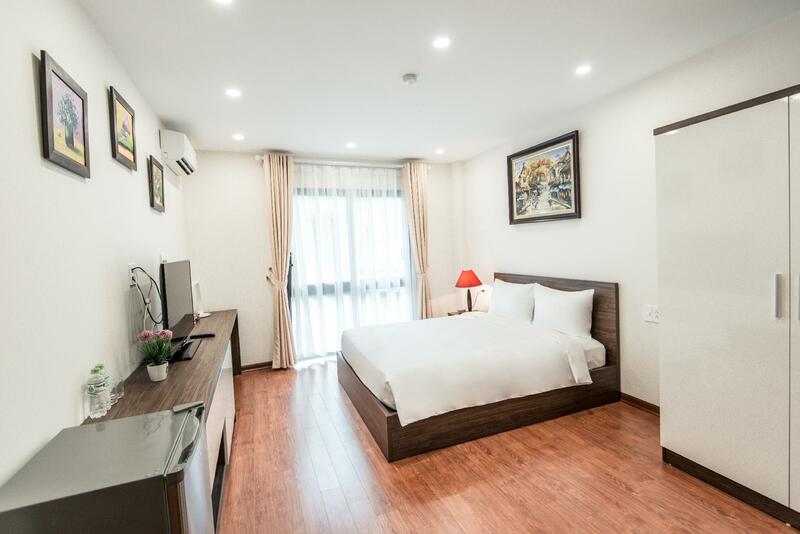 This is not hotel, an apartment but you can book as hotel. Each room, quite wide enough to stay. Big empty flige, Bathtab, everything I need are there. And everyday, they provide landry service complimentaly. The room was clean and well designed. Towels were very clean and bathroom was large and nice. You can find every equipment to live except a hairdryer. The hotel locates along a narrow path which makes it not easy to find, but the receptionist will direct you there if you contact them. LOTTE market is nearby, just five minutes walk. Also, Japanese embassy is close to the hotel, so you can enjoy Japanese food around there. It's convenient to get to the famous secenery spot. Either walk or car won't take too long. 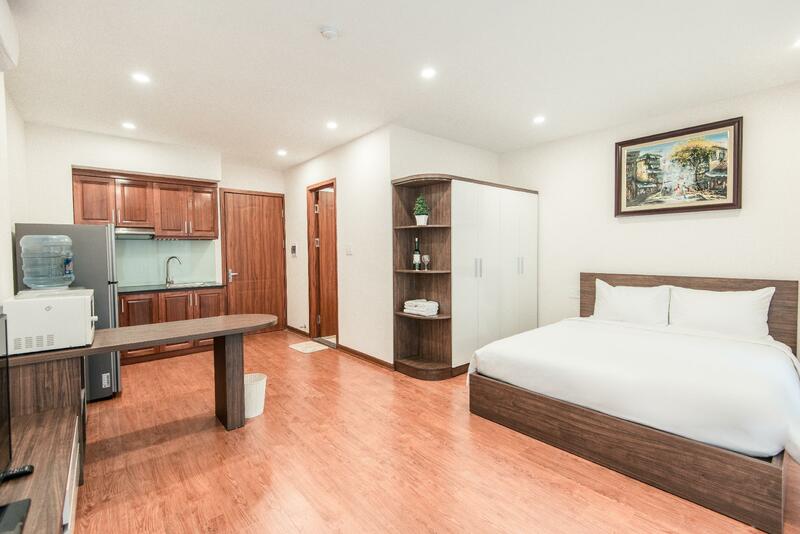 The room is big enough with cosy facilities, such as frige, bathroom master, a 30-inch TV. By the way, it also has electronic oven and kifes, but you have to bring your own pan. They offer free laundry; however, nobody picked my dirty clothes when I was outside. And they forget to change the disposable toiletries the second day. The receptionists are friendly and helpful, if you have any question on your trip they are willing to solve it. When I booked this hotel yesterday I saw two rooms were available. So I finished the booking in here. But when I arrived Palmo Hotel at 12midnight. they told me the room is not available.. and then they lead me to another old fashioned hotel which name is Minami hotel. It's too late time so I couldn't help refuse their offer. I requested Non smoking room. but they assigned the smoking room. But The Security guy and Kitchen aunt at 1st Floor staffs were so kind. Anyway I don't wanna book again in here and I don't wanna recommend this hotel to my all of my friends. Love the place, size and general area - the location is in a very narrow street, but no problem as such. A very well equiped studio appartment for arriving expat workers or longer stay tourists - it was exactly as shown in the photos! Units well maintained & served. We were very comfortable. Excellent (and surprisingly stable) wi-fi, with good television service, and well equiped kitchen. Two drawbacks - neither within the property's control. The location is over-quiet, with the majority of buses away from this block, running down streets to the north and south. Even the usual street vendors and cafes are on the perimeter rather than adjacent.The No.9 bus will get you (given time) to the Old Quarter. Construction - this is the big one. There are three projects in the immediate vicinity of the building, with the closest occasionally starting at 5.30am and running to 9.30pm. Angle-grinders and peaceful rest do not mix. 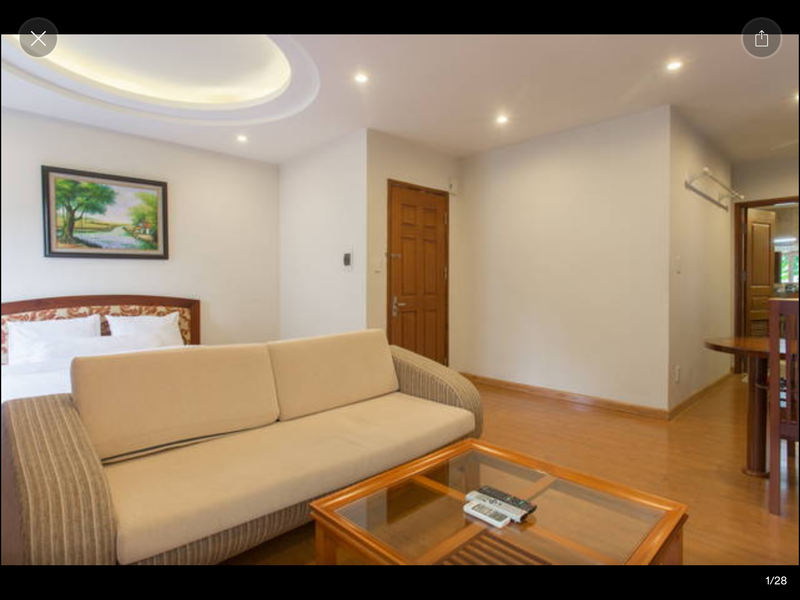 (+) Positive : - Good location just 5 mins walk to Lotte Center Hanoi. 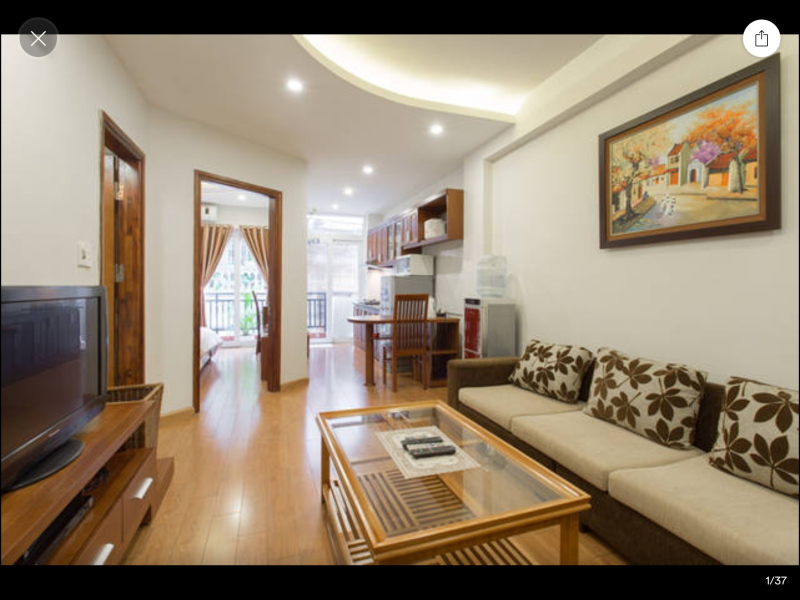 - Quite and very large studio apartment. - Room is very complete with high speed internet, two large TV, clean, and also comes with kitchen set. - Balcony (-) Negative : - Some noise from neighborhood construction works when I stayed there. It is in a back alley. Taxis can't get you time the door. The staff, however, are very helpful and try to overcome this problem. The alley ways here are not clear on Google maps. Highly recommended. Clean, includes everything you'd want in an apartment. The owner of the apartment even called us on the first day to make sure we arrived safe and well. Parfait. Rien à dire de plus. Tout est au top !